LIFE HACKS #2334 COOKIE BOWLS: WRAP COOKIE DOUGH ON THE BOT - ProudMummy.com the Web's Community for Mums. 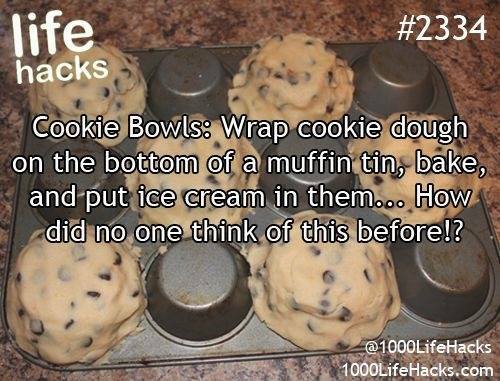 LIFE HACKS #2334 COOKIE BOWLS: WRAP COOKIE DOUGH ON THE BOTTOM OF A MUFFIN TIN, BAKE, AND PUT ICE CREAM IN THEM... HOW DID NO ONE THINK OF THIS BEFORE! ?